The generated applications created by AppGini display the records of each table in a separate page. But sometimes, you might want to see two tables side-by-side in the same page. 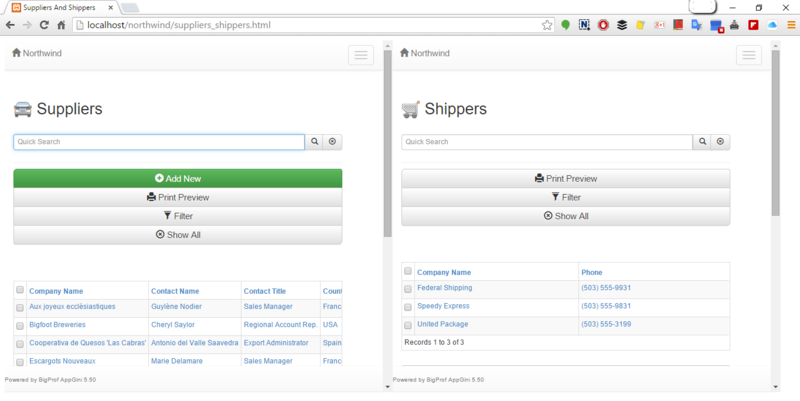 For example, the following screenshots from the Northwind application show the suppliers table and the shippers table, each on a separate page. You have to switch between tabs or browser windows if you are working with both tables. If you often work with both tables together, you might wish to display them side-by side instead, as shown below. Change suppliers_view.php and shippers_view.php in the above code to the appropriate file names desired. Of course, this trick isn't 100% perfect. As you can see, the left table is too wide to fit on half the screen, which causes an annoying horizontal scroll bar to appear. However, I guess this could be an acceptable compromise in some cases.